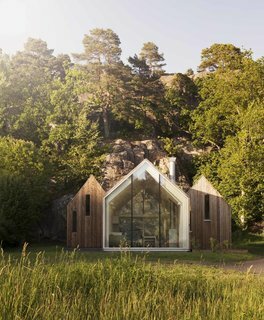 A constellation of cabins in Norway strikes the perfect balance between public and private space. Family retreats allow multiple generations to spend quality time together, but sometimes that can be too much of a good thing. The ideal family retreat, then, should allow for time together, while also making it possible for everyone to have their own space, which is precisely what Reiulf Ramstad Arkitekter’s Micro Cluster Cabins aim to accomplish. The cozy escape features a central living area where guests can gather and two private wings to which they can retreat. The home retains the outward appearance of a traditional Scandinavian of cabin community. It also makes the most of its site. The sun’s rays are absorbed by the rock face behind the retreat and gradually released, creating a pleasant climate. The family retreat abuts a rocky cliff in Herfell, Norway. The central cabin provides communal living spaces, while the two cabins that flank it are used as private sleeping quarters. With their matching peaked roofs, every cabin nods to the traditional form of countryside retreats. The cluster’s pine cladding has been treated to speed up the aging process, giving it a warm patina. Full-height glazing caps the central living area. A rigid steel frame concealed within its wood envelope allows for uninterrupted sight lines and creates a single, open-plan living space. The auxiliary cabins contain the sleeping quarters. A ladder leads to a sleeping loft underneath a gabled ceiling. The cabin’s bathroom is situated beneath the loft and features clean white fittings and tile. A shed provides storage for the owners’ tools as well as wood for the fireplace. It features the same aged pine finish as the main home. A rear deck is nestled behind the central cabin, flanked by the sleeping quarters. Inside, the dining table sits beneath a single hanging lamp.